Naples, FL - To help ensure flood protection for Collier County residents, the South Florida Water Management District's (SFWMD) Big Cypress Basin will begin work this week to clear trees and overgrown vegetation from the banks of a 6-mile stretch of the Golden Gate Main Canal. In recent weeks, Basin staff has been reaching out to property owners along the first phase of the project to keep them informed about this public safety measure. 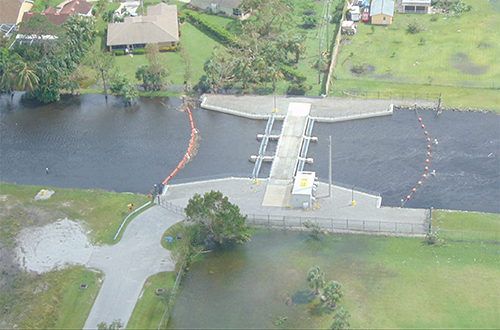 "As Hurricane Irma and last year's record wet season plainly showed, a well-maintained flood control system is critical to protecting families and businesses," said Rick Barber, Basin Board Chairman and SFWMD Governing Board member. "The Basin is working to clear the banks of the Golden Gate Canal to help ensure this vital artery in Collier County is free of blockages when it's most needed." The first phase of the Golden Gate Main Canal tree clearing project is slated to begin April 4 and is expected to be complete by the end of June. This phase will affect a stretch of the canal from the Interstate 75 bridge east to the Santa Barbara Boulevard bridge. Another segment from I-75 west to the Golden Gate No. 2 structure at 63rd Street Southwest will begin after the initial work is completed. The tree clearing effort is part of SFWMD's normal cycle of maintenance to ensure its regional canals function optimally to move water before, during and after storms. For public safety purposes, canals must have an unobstructed right of way on their banks. Fallen vegetation or debris can slow the flow of water in canals or block downstream water control structures, preventing water from draining properly and increasing the risk of flooding. Field crews also must have clear access to canals for routine maintenance, repair and debris removal, especially in emergencies. Learn more about the Golden Gate Main Canal Tree Removal Project. Watch a video on SFWMD's canal maintenance program. Read more about the importance of keeping canal right of way clear for flood control.